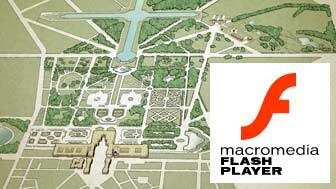 To view the Versailles map and video, you need the free Macromedia Flash Player, version 6 or higher. Get it now. The queen’s rooms were largely refurbished by Marie Antoinette and reflect the opulent style that made her such a target of public criticism – despite the fact that it was no more lavish than the king's quarters. The suite includes the Queen's Guards Room (which housed security staff), Antechamber (for public events), Peers' Salon (where her ladies in waiting gathered), and Bedroom. In the Queen's Chamber, her bed is separated from the rest of the room by a gold railing, defining the area where courtiers gathered to help her with various grooming rituals. Upon awakening, Marie Antoinette was assisted out of bed. Clothing was selected for her by high-ranking noblewomen. These ladies-in-waiting would then decide who would dress the queen. Her hair was brushed and arranged, and her makeup was done. Marie Antoinette felt stifled by these lengthy rituals and embarrassed by their public nature, complaining passionately to her mother, "I put on my rouge and wash my hands in front of the whole world!" The bed railing also served as a “velvet rope” of sorts, designating where aristocrats could stand for the births of royal offspring, which were subject to the same close observation by members of the court. After the long and painful delivery of her first child, Marie Antoinette broke tradition by steadfastly refusing another public birth. The queen’s private apartments are traditionally more modest than the King’s. However, during Marie Antoinette’s reign, she redecorated her chambers (sometimes called apartments or cabinets) with furniture in the latest style by the most renowned designers. This made her chambers considerably more fashionable than those of her husband. Marie Antoinette was a new sort of queen not simply because she spent a lot of money, but because she defied tradition in the name of fashion and claimed for herself a prominent role in the serious business of style. Read about Marie Antoinette's early years. Learn more about the Queen's story.